With more than 60 years of combined experience, owners, Mike & Lynette Sloan have dedicated their lives to producing and making world-class bratwurst and sausages. Success for the Sloan’s has been sweet and long-lived. Mike’s career began at a young age at his parents meat processing business in Swiss, MO. This is where he perfected his skills and recipes, working his way to the president and operating manager of his family’s business, Swiss Meats & Sausage Company. In June 2011, Mike & Lynette ventured out on their own; purchasing and old auto parts store in downtown, historic Hermann, MO. With the help of friends and contractors, they began renovating immediately and opened the doors to the Hermann Wurst Haus in only 75days. Today Mike and Lynette are living and breathing their true passion, owning their own business where they are creating award-winning bratwurst and sausages for everyone to enjoy. June 2011 – The building at 234 East First St. in downtown historic Hermann, formerly known as NAPA-Fritz Auto Parts, is purchased by Mike and Lynette Sloan. July 2011 – Construction tear down, remodel, plumbing, concrete work begins on future Hermann Wurst Haus. Wurstmeister Mike gets rid of all the fan belts, spark plugs and anything else he doesn’t think he will need to make sausage with. September 1, 2011 – Hermann Wurst Haus opens after a fast and furious construction phase with Wurstmeister Mike, wurst wife Lynette, and two associates. Twenty two seats are available. Mike wonders how they will fill those seats. October 2011 – Cardinals win the World Series, same year as the Wurst Haus opens – a sign from above?? Octoberfest all month. O.M.G. November 2011 – Hermann Wurst Haus accepts deer processing, the first one arrives from Rhineland at 8:21 am opening Saturday morning, nice 10 point buck, Mike capes it followed by many more. December 2011 – Christmas at the Hermann Wurst Haus, our mail order program begins, 50 packages are sent out to lucky buyers and givers. January 2012 – Time to catch our breath, reflect and have a glass of wine, glass of beer, glass of vodka, glass of brandy and then another glass of beer…. February 2012 – Hermann Wurst Haus in conjunction with the Hermann High School, hosted a fundraiser dinner & auction for the Driving with Distractions Program, netting $13,000 plus dollars. March 2012 – Hermann Wurst Haus wins its first ever awards for a meat and sausage competition, 14 awards in all! July 2012 – Wurstmeister Mike is elected President of the American Association of Meat Processors at their annual convention in Minneapolis, MN. AAMP is the largest meat trade organization in North America, representing the mid to small sized processors. A nice honor for Mike and the Wurst Haus. August 2012 – New tables, inside seating and outdoor patio seating are added. The Wurst Haus now seats 90 people. Equipment is upgraded to keep up with demand. October 2012 – Octoberfest all month. O.M.G. 2! November 2012 – New help is hired to help with deer season processing and mail order. December 2012 – Large crowds during Christmas, Santa Claus is on site for pictures, presents and good cheer. March 2013 – More “Wurst” awards from the Wurstfest and MO Association of Meat Processors. Mike starts teaching Sausage Making 101 Classes, which fill up quickly. July 2013 – Mike and Lynette attend the American Association of Meat Processors annual convention in Charleston, South Carolina. Mike presides over all meetings, awards and banquet. September 2013 – Production of hand-crafted Wurst Haus beers begin; Butcher Block Lager, Golden Buck Ale, Wurstmeister Wheat and Steamboat Smoked Ale. October 2013 – Octoberfest all month. O.M.G. 3! Christmas 2013 – Deer processing completed, tons of deer sausage to make, holidays are here and cold beer to drink. Life is good and busy. January 2014 – Wurst Haus staff has now grown to 8 full time and 5 part time employees. 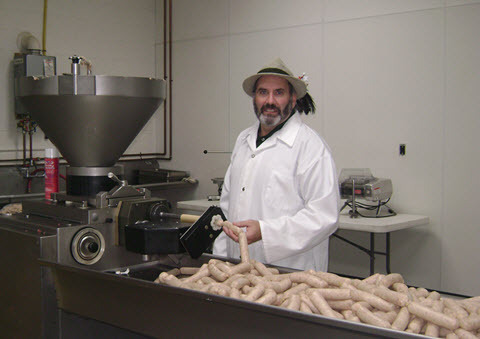 February 2014 – First Sausage Making 101 Class is filled to over flow capacity with 44 students. March 2014 – More awards for Wurst Haus from Wurstfest and the MO Association of Meat Processors, Makin’ Bacon 101 Class is a sell out again, new German chef Hansel is hired. May 2014 – Wurst Haus Crème Sodas and Root Beer is available by the draft cold mug. July 2014 - Wurstmeister Mike and Wurst wife Lynette attend the American Association of Meat Processors annual convention where Mike is recognized for his years of service to the association as President as he hands the gavel to the new President Tim Haen of Haen Meat Packing, Milwaukee, WI. August 2014 - New high speed, computerized, automatic, form, fill, seal, packaging machine is ordered from Ultra Source in Kansas City, Mo. This one of a kind packaging machine is built specific for Wurst Haus to keep up with sausage demand. September 2014 - Wurst classes start in September, all are sell out, creating much recognition of the Wurst brand and great PR. Sales are pretty good too! October 2014 - New Smokehaus arrives and put into place, old one is quickly sold. The demand for our products is just crazy, what's wrong with people!? Octoberfest all month long, OMG 4. November 2014 - Octoberfest done, no rest, time for deer season processing, making some good production time with upgraded equipment. December 2014 - Hermann Wurst Haus featured story in Independent Meat Processor, a national trade publication. Editor Sam Gazadiak flies in from PA and spends about 5 hours at Wurst Haus, taking pictures and interviewing Wurstmeister Mike about his career and Wurst Haus. He tells Mike he (Sam) has been all over the U.S.A. writing meat stories and he has never experienced anything like the Hermann Wurst Haus. He thought highly of it to tell Mike before he flew back that Wurst Haus was going on the cover. Our first cover but not our last. Christmas mail orders are pouring in, sidewalk traffic pouring in, custom orders pouring in, what's wrong with all these people!? January 2015 - Happy New Year, time to reflect on family, friends, and business. Wurst classes resume, sell out quickly! March 2015 - Many more awards won by Hermann Wurst Haus at the Missouri Association of Meat Processors, including the Best of Missouri Award for our snack sticks. Mike is a speaker at the convention, speaking on marketing. Wurst Haus wins more awards at the Hermann Wurstfest including The Best Of Show for its Sweet Peppered Bison Bologna. Wurst Haus continues building its brand and credibility. April 2015 - Second new Smokehaus arrived. June 2015 - Mike and Lynette attend and participate in American Association of Meat Processors convention in Springfield Illinois. September 2015 - Hermann Wurst Haus mascot arrives. Hermann the Bratwurst mascot is a hit with customers, sidewalk traffic, parades, special in store events, and Amtrak train riders. November 2015 - Another well written article on the Wurst Haus, called Venison Vittles, written by Jason Jenkins of Missouri Ruralist, featuring Wurstmeister Mike detailing deer hunting sausage making tips. Wurst 101 classes sell out overnight for the next 3 months. More classes are added due to demand! December 2015 - Merry Christmas, mail order business is now well established, tons of deer sausage to make, foot traffic doesn't stop, more tables and chairs added, everyone wants our Wurst! January 2016 - Big announcement, Hermann Wurst Haus enters and wins Gold, Silver, and Bronze in the first ever German Butchers Association IFFA contest, held in Madison Wisconsin. Wurstmeister Mike's family and friends make plans to accept awards in Frankfurt Germany, Woo Hoo! February 2016 - Bigger announcement, Hermann Wurst Haus is nominated and receives the U.S. Small Business Administration Rural Small Business Award for Eastern Missouri, more awards, more pictures, more covers, more banquets. Great credibility tool. March 2016 - Hermann Wurstfest brings huge crowds, big competition, and Hermann the Bratwurst mascot is a big hit with the crowds and kids. April 2016 - Antique Show at the Festhalle, Hofgarten, and Tin Mill bring out large crowds. We feature our German Sampler plate and Bratwurst and Hot Dog cart is on the street corner, fun, fun, fun! May 2016 - Hermann Maifest, opening of the Wurst Comedy Night Ever at the Hermann Wurst Haus featuring dinner, lights, show with Longhorn the Comedian, patriotic cowboy from Texas, by way of St. Louis! January 2019 - Hermann Wurst Haus received the Distinguished Small business Award form the Hermann Area Chamber of Commerce at the Gerald Engemann Memorial Awards Banquet, Thursday, Jan. 10.